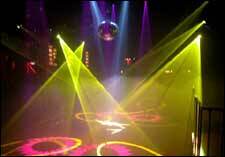 Saturday Night Fever is an event that took place on 29-Oct-2005 in Hyderabad. Saturday Nights are for heading away from town. But Durgam Cheruvu makes a night in the wild as cozy and agreeable as one in the next door pub. The sprawling open air dance-floor and the 100,000 watt music system, by the lake, will accentuate the nip in the air to a thrill. DJ Amit, and DJ Sanjay who is coming down from Mumbai to re-create his success at the Dandiya Nite, join hands to work up the heat in the chill. Entry is Rs. 500 for one person, redeemable at purchase of food and drinks. For more details, please contact Durgam Cheruvu at 55590000. Be the first to comment on Saturday Night Fever! Just use the simple form below. fullhyd.com has 700,000+ monthly visits. Tell Hyderabad what you feel about Saturday Night Fever!